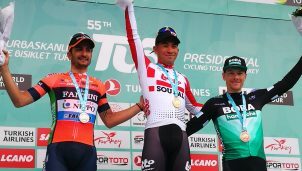 Sam Bennett se ha impuesto en la tercera etapa de la París-Niza que, esta vez sí, se ha resuelto con una llegada masiva. 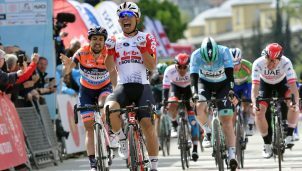 El irlandés ha sido más rápido que Caleb Ewan. A diferencia de las dos jornadas anteriores, esta vez el viento ha soplado más bien de cara por lo que la posibilidad de abanicos se ha reducido enormemente. Salvo en los últimos kilómetros, cuando de nuevo el Team Sky ha enfilado y cortado el pelotón. Otra vez Luke Rowe ha enfilado ese gran grupo y, cuando se ha quitado, Kwiatkowski ha seguido castigando junto a Egan Bernal y han vuelto a formar el corte, que durante un momento se ha quedado en apenas cuatro corredores. 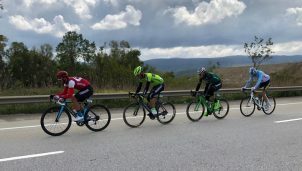 Los Groupama-FDJ han conseguido cerrar el hueco en cuanto, en un nuevo cambio de carretera, el aire ha vuelto a entrar de cara. A partir de ahí, todo destinado al sprint final, donde Bennett ha sido más rápido que Ewan, mientras que para Groenewegen la fase de abanicos ha pesado demasiado. 3 JAKOBSEN Fabio Deceuninck – Quick Step m.t. 4 MCLAY Daniel EF Education First m.t. 5 COQUARD Bryan Vital Concept – B&B Hotels m.t. 6 BONIFAZIO Niccolò Direct Energie m.t. 8 DÉMARE Arnaud Groupama – FDJ m.t. 10 THEUNS Edward Trek – Segafredo m.t. 11 GROSU Eduard Michael Delko Marseille Provence m.t. 12 MARECZKO Jakub CCC Team m.t. 13 BOASSON HAGEN Edvald Team Dimension Data m.t. 14 GREIPEL André Team Arkéa Samsic m.t. 15 PÉRICHON Pierre-Luc Cofidis, Solutions Crédits m.t. 16 LAPORTE Christophe Cofidis, Solutions Crédits m.t. 17 HOULE Hugo Astana Pro Team m.t. 18 MOLARD Rudy Groupama – FDJ m.t. 19 TRENTIN Matteo Mitchelton-Scott m.t. 20 MEZGEC Luka Mitchelton-Scott m.t. 21 TEUNISSEN Mike Team Jumbo-Visma m.t. 22 GALLOPIN Tony AG2R La Mondiale m.t. 23 DEGENKOLB John Trek – Segafredo m.t. 24 COLBRELLI Sonny Bahrain Merida m.t. 25 DE VREESE Laurens Astana Pro Team m.t. 26 VANDENBERGH Stijn AG2R La Mondiale m.t. 27 HAIG Jack Mitchelton-Scott m.t. 28 BAUER Jack Mitchelton-Scott m.t. 29 KELDERMAN Wilco Team Sunweb m.t. 30 QUINTANA Nairo Movistar Team m.t. 31 NAESEN Oliver AG2R La Mondiale m.t. 32 SÁNCHEZ Luis León Astana Pro Team m.t. 33 CALMEJANE Lilian Direct Energie m.t. 34 KLUGE Roger Lotto Soudal m.t. 35 HOLLENSTEIN Reto Team Katusha – Alpecin m.t. 36 GROSSSCHARTNE Felix BORA – hansgrohe m.t. 37 EISEL Bernhard Team Dimension Data m.t. 38 KIRSCH Alex Trek – Segafredo m.t. 39 KITTEL Marcel Team Katusha – Alpecin m.t. 40 MADOUAS Valentin Groupama – FDJ m.t. 41 PEDERSEN Casper Team Sunweb m.t. 42 KWIATKOWSKI Michał Team Sky m.t. 43 CURVERS Roy Team Sunweb m.t. 44 KONRAD Patrick BORA – hansgrohe m.t. 45 BERNAL Egan Team Sky m.t. 46 ŠIŠKEVIČIUS Evaldas Delko Marseille Provence m.t. 47 JUNGELS Bob Deceuninck – Quick Step m.t. 48 DEBUSSCHERE Jens Team Katusha – Alpecin m.t. 49 BENNETT George Team Jumbo-Visma m.t. 50 GUARNIERI Jacopo Groupama – FDJ m.t. 51 DAVIES Scott Team Dimension Data m.t. 52 CHAVES Esteban Mitchelton-Scott m.t. 53 VENTOSO Francisco José CCC Team m.t. 54 ROELANDTS Jürgen Movistar Team m.t. 55 ZAKARIN Ilnur Team Katusha – Alpecin m.t. 56 GILBERT Philippe Deceuninck – Quick Step m.t. 57 VICHOT Arthur Vital Concept – B&B Hotels m.t. 58 BARDET Romain AG2R La Mondiale m.t. 59 GARCÍA Iván Bahrain Merida m.t. 60 CHEREL Mickaël AG2R La Mondiale m.t. 61 MONFORT Maxime Lotto Soudal m.t. 62 GAUTIER Cyril Vital Concept – B&B Hotels m.t. 63 TURGIS Anthony Direct Energie m.t. 64 DE KORT Koen Trek – Segafredo m.t. 65 KOREN Kristijan Bahrain Merida m.t. 66 HANSEN Adam Lotto Soudal m.t. 67 BAKELANTS Jan Team Sunweb m.t. 68 PANTANO Jarlinson Trek – Segafredo m.t. 69 VAN LERBERGHE Bert Cofidis, Solutions Crédits m.t. 70 IZAGIRRE Ion Astana Pro Team m.t. 71 CICCONE Giulio Trek – Segafredo m.t. 72 SABATINI Fabio Deceuninck – Quick Step m.t. 73 TEUNS Dylan Bahrain Merida m.t. 74 BOECKMANS Kris Vital Concept – B&B Hotels m.t. 75 REZA Kévin Vital Concept – B&B Hotels m.t. 76 ERVITI Imanol Movistar Team m.t. 77 HAUSSLER Heinrich Bahrain Merida m.t. 78 DE LA PARTE Víctor CCC Team m.t. 79 DRUCKER Jempy BORA – hansgrohe m.t. 80 SOUPE Geoffrey Cofidis, Solutions Crédits m.t. 81 CARRETERO Héctor Movistar Team m.t. 82 VERMOTE Julien Team Dimension Data m.t. 83 SOSA Iván Ramiro Team Sky m.t. 84 FINETTO Mauro Delko Marseille Provence m.t. 85 VAN GARDEREN Tejay EF Education First m.t. 86 MARTÍNEZ Daniel Felipe EF Education First m.t. 87 CRADDOCK Lawson EF Education First m.t. 89 ULISSI Diego UAE-Team Emirates m.t. 90 VALLS Rafael Movistar Team m.t. 93 SÉNÉCHAL Florian Deceuninck – Quick Step m.t. 94 FEDELI Alessandro Delko Marseille Provence m.t. 95 POLJAŃSKI Paweł BORA – hansgrohe m.t. 96 MAES Nikolas Lotto Soudal m.t. 97 POLITT Nils Team Katusha – Alpecin m.t. 98 SCHWARZMANN Michael BORA – hansgrohe m.t. 99 JANSEN Amund Grøndahl Team Jumbo-Visma m.t. 100 PICHON Laurent Team Arkéa Samsic m.t. 103 GAUDIN Damien Direct Energie m.t. 104 KONOVALOVAS Ignatas Groupama – FDJ m.t. 106 EL FARES Julien Delko Marseille Provence m.t. 108 MARCATO Marco UAE-Team Emirates m.t. 109 ANTUNES Amaro CCC Team m.t. 110 DOCKER Mitchell EF Education First m.t. 111 HALLER Marco Team Katusha – Alpecin m.t. 113 ANACONA Winner Movistar Team m.t. 114 TERPSTRA Niki Direct Energie m.t. 115 VERVAEKE Louis Team Sunweb m.t. 116 DECLERCQ Tim Deceuninck – Quick Step m.t. 117 COMBAUD Romain Delko Marseille Provence m.t. 118 LE GAC Olivier Groupama – FDJ m.t. 119 KEISSE Iljo Deceuninck – Quick Step m.t. 120 LINDEMAN Bert-Jan Team Jumbo-Visma m.t. 121 SCULLY Tom EF Education First m.t. 125 EENKHOORN Pascal Team Jumbo-Visma m.t. 126 DE GENDT Thomas Lotto Soudal m.t. 127 SUTHERLAND Rory UAE-Team Emirates m.t. 128 MÜLLER Patrick Vital Concept – B&B Hotels m.t. 129 BARTA Will CCC Team m.t. 130 LE TURNIER Mathias Cofidis, Solutions Crédits m.t. 131 BERNARD Julien Trek – Segafredo m.t. 132 FRANK Mathias AG2R La Mondiale m.t. 133 EDET Nicolas Cofidis, Solutions Crédits m.t. 134 ŠPILAK Simon Team Katusha – Alpecin m.t. 135 HENAO Sergio UAE-Team Emirates m.t. 136 HENAO Sebastián Team Sky m.t. 137 LÓPEZ Miguel Ángel Astana Pro Team m.t. 138 NARVÁEZ Jhonatan Team Sky m.t. 139 SOLER Marc Movistar Team m.t. 140 NIEVE Mikel Mitchelton-Scott m.t. 141 CORT Magnus Astana Pro Team m.t. 142 YATES Simon Mitchelton-Scott m.t. 143 GEOGHEGAN HART Tao Team Sky m.t. 144 POZZOVIVO Domenico Bahrain Merida m.t. 145 MOINARD Amaël Team Arkéa Samsic m.t. 146 COSNEFROY Benoît AG2R La Mondiale m.t. 147 HIVERT Jonathan Direct Energie m.t. 148 TEN DAM Laurens CCC Team m.t. 149 DE MARCHI Alessandro CCC Team m.t. 11 GROSSSCHARTNE Felix BORA – hansgrohe m.t. 13 GREIPEL André Team Arkéa Samsic m.t. 14 DEGENKOLB John Trek – Segafredo m.t. 17 TEUNISSEN Mike Team Jumbo-Visma m.t. 18 COLBRELLI Sonny Bahrain Merida m.t. 19 CALMEJANE Lilian Direct Energie m.t. 20 QUINTANA Nairo Movistar Team m.t. 21 TURGIS Anthony Direct Energie m.t. 22 KELDERMAN Wilco Team Sunweb m.t. 23 THEUNS Edward Trek – Segafredo m.t. 24 DRUCKER Jempy BORA – hansgrohe m.t. 25 MADOUAS Valentin Groupama – FDJ m.t. 26 BENNETT George Team Jumbo-Visma m.t. 28 ZAKARIN Ilnur Team Katusha – Alpecin m.t. 32 JANSEN Amund Grøndahl Team Jumbo-Visma m.t. 43 CRADDOCK Lawson EF Education First m.t. 47 KOREN Kristijan Bahrain Merida m.t. 48 VAN GARDEREN Tejay EF Education First m.t. 53 KITTEL Marcel Team Katusha – Alpecin m.t. 54 DAVIES Scott Team Dimension Data m.t. 55 GUARNIERI Jacopo Groupama – FDJ m.t. 68 MEZGEC Luka Mitchelton-Scott m.t. 69 SABATINI Fabio Deceuninck – Quick Step m.t. 70 MONFORT Maxime Lotto Soudal m.t. 73 VENTOSO Francisco José CCC Team m.t. 74 CHAVES Esteban Mitchelton-Scott m.t. 75 PANTANO Jarlinson Trek – Segafredo m.t. 76 MARTÍNEZ Daniel Felipe EF Education First m.t. 80 VICHOT Arthur Vital Concept – B&B Hotels m.t. 81 REZA Kévin Vital Concept – B&B Hotels m.t. 86 NAVARDAUSKAS Ramūnas Delko Marseille Provence m.t. 87 ANACONA Winner Movistar Team m.t. 89 DE VREESE Laurens Astana Pro Team m.t. 90 DEBUSSCHERE Jens Team Katusha – Alpecin m.t. 91 CICCONE Giulio Trek – Segafredo m.t. 92 HANSEN Adam Lotto Soudal m.t. 93 FINETTO Mauro Delko Marseille Provence m.t. 94 HANSEN Jesper Cofidis, Solutions Crédits m.t. 101 WELTEN Bram Team Arkéa Samsic m.t. 104 KEISSE Iljo Deceuninck – Quick Step m.t. 107 HOLLENSTEIN Reto Team Katusha – Alpecin m.t. 108 PÉRICHON Pierre-Luc Cofidis, Solutions Crédits m.t. 109 BONIFAZIO Niccolò Direct Energie m.t. 110 SOUPE Geoffrey Cofidis, Solutions Crédits m.t. 111 DE LA PARTE Víctor CCC Team m.t. 112 BOECKMANS Kris Vital Concept – B&B Hotels m.t. 113 IZAGIRRE Ion Astana Pro Team m.t. 115 CARRETERO Héctor Movistar Team m.t. 116 GEOGHEGAN HART Tao Team Sky m.t. 117 NARVÁEZ Jhonatan Team Sky m.t. 119 VALLS Rafael Movistar Team m.t. 122 TEN DAM Laurens CCC Team m.t. 124 DE MARCHI Alessandro CCC Team m.t. 125 SOLER Marc Movistar Team m.t. 126 LÓPEZ Miguel Ángel Astana Pro Team m.t. 127 NIEVE Mikel Mitchelton-Scott m.t. 132 LE TURNIER Mathias Cofidis, Solutions Crédits m.t. 133 FRANK Mathias AG2R La Mondiale m.t. 134 HENAO Sebastián Team Sky m.t. 135 POZZOVIVO Domenico Bahrain Merida m.t. 136 MOINARD Amaël Team Arkéa Samsic m.t. 139 DE GENDT Thomas Lotto Soudal m.t. 140 HENAO Sergio UAE-Team Emirates m.t. 145 SOSA Iván Ramiro Team Sky m.t. 148 HIVERT Jonathan Direct Energie m.t.